There are many stresses that can build up from being a single parent, trying to deal with everything yourself can burn you out and lead to more harm than good. Being a single parent is no walk in the park especially if you have the responsibility for more than one child, add the responsibility of work commitments, school commitments, running errands and chores, you have a recipe for chaos. Every single parent can do with a little extra help sometimes, by giving children the opportunity to help with chores; it can help set an expectation, provide routine and ease the burden. Ensure your children understand what you expect of them in terms of keeping the home clean. 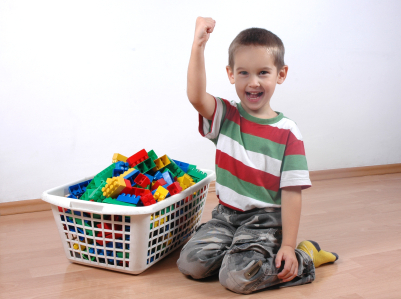 Play with one toy at a time before moving onto the next will prevent an untidy playroom. Make the bed first thing in the morning gives them responsibility. Place clothing in the laundry basket instead of leaving them lying on the bathroom floor. Allowing them to understand what is expected can be an effective first step. By having a routine, children will know what to expect and therefore are more likely to adapt to the situation. Having time to play, to clean, to eat will help them understand what is supposed to happen at certain times of the day with fewer arguments. When it comes to young children, you need to be specific and give precise instructions. There is no use telling a toddler to clean up a play room as it may be too overwhelming for them or may not understand what is required. Giving straight forward instructions, one at a time will guide them in the right direction. For example, you can say “Please pick up all the blocks and place them in the container”. Cleaning is a chore and you can sometimes feel that it is easier to do it yourself rather than getting the kids involved. However, you can make it fun and there is nothing children want more other than to make you proud. So put on a song and have fun and dance with your kids whilst your tidy up. Having the support of a reliable professional house cleaner that you can trust can ease the burden tremendously. Professional cleaners have the tools, equipment and expertise to efficiently complete tasks that could take you twice as long if you were to do it yourself. Having to juggle all the parenting duties as a single parent can affect your mental well-being and eventually something will have to give. 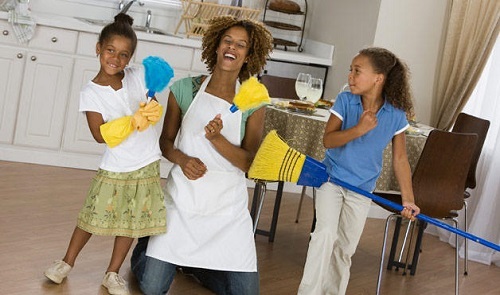 Having a cleaner come by once a month can ultimately give you back some of that time and energy to creating a nurturing environment for your children. One of the most difficult jobs anyone can have in the world is that of a parent. Raising kids is even more difficult for those who have to undertake the task without having a partner to assist in parenting children. Single parents are faced with several more challenges because they normally have to be both the father and mother as well as hold down a job to put a food on the table and keep a roof over their family’s head. It is difficult to be everything for everyone, but with the following parenting advice, you will learn and understand how to effectively raise children with less stress. Working together as a unit is important for a family to function properly. This is particularly true for working parents and single parents. When everything is left one person to do, things become harder. You need to learn how to delegate the responsibilities of the house so that everyone has certain tasks that they are responsible to perform. 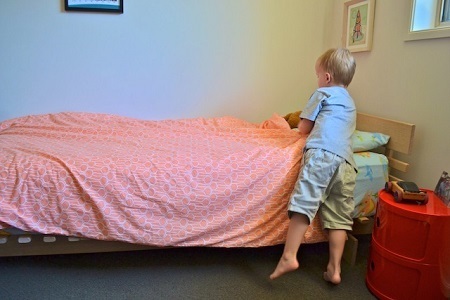 Even very young people can perform certain chores like raising putting the laundry in the hamper, pilling the covers up on their bed or picking up their toys. This kind of teamwork is an essential thing for raising children who comprehend responsibility as well as develop strong child-parent relationships. Several parents try to be more of a friend to their children instead of actually being a parent to them. This is a serious problem because the children will have difficulty in learning how to respect people in authority. You, the parent is the authoritarian in all of the kid’s parent relationships in your family. Your kids will believe that they are on the same playing field like you without you taking your position as the head of the home. Keep in mind; you are the parent and not your kid’s friend. Alone time is very significant for parents, but it is normally difficult to find some time that you can have for yourself. The stress often faced by working parents and single parents can affect relationships between the children and single parent. That is why taking time for yourself is not merely well deserved but it is necessary in order to be a great parent. Even if you can only set aside one hour every week to get away from everything, you must do it. You will feel better concerning yourself and you will see fewer problems in your child-parent relationships. Children usually vie to get their parents’ attention and this may be overwhelming when you are raising kids without a partner or spouse. Since there is only one parent, all of your children will want to gain your attention. Parental counseling: This can simply be solved by creating some time that you will spend engaging in something unique with this child. It does not cost you any money. You can simply read a book together; you could go for a bike ride or play a game of Go Fish. Whatsoever it is that you select to do together does not actually matter; as long as you spend the time to build your child-parent relationships you will be raising kids who are well-adjusted and happy. Single parents can’t be at more than one place at a time and unfortunately, teachers and activities instructors don’t seem to understand the simple fact that you are raising children on your own. You will be required to set priorities as to which event you will be attending on a particular day. The best parenting help is to engage your kids in a conversation about which event they would most like you to attend. This will help them to understand that you wish you could attend all the events but you can’t. Knowing these concerns you will help your kids develop healthier child-parent relationships.